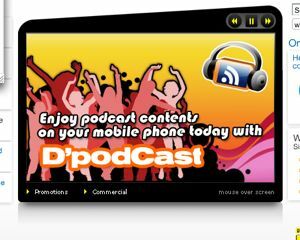 Mobile communications provider DiGi Telecommunications, announced this week the debut of D’podCast, an on-demand service for mobile phone users, the first of its kind in Malaysia. D’podCast is the result of a collaboration between DiGi and digital media company Stanton Technologies, and is part of DiGi’s ongoing efforts to widen its range of mobile internet services. D’podCast users may choose from six broad categories of popular podcast “channels:” entertainment, lifestyle, news and business, recreation and sports and technology. Within those six categories, D’podCast offers nearly 300 video and audio programs. The company says that more shows will be added in time. The podcast service costs 3 Malaysian Ringgit (RM), (about $0.89 US) for a Daily Pass; a monthly pass is 6 RM or just under $2 US. Streaming of video and audio content is free and users only need to pay for normal data charges when browsing WAP pages. D’podCast content can be streamed live anytime and anywhere as long as there is GPRS/EDGE connectivity.